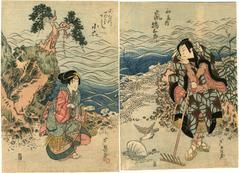 Chirimen-gama-e (crepe print); a rare example (very few have survived from the earlier periods of Osaka printmaking). 9th lunar month of 1824: premiere at the Naka no Shibai of the drama "Banchō Sarayashiki" [The Dish Mansion at Banchō], a revision of the puppet play by Nakawa Harusuke I; it stars Ōtani Tomoemon II and Arashi Koroku IV in the roles of Aoyama Daihachi and Okiku. Watōnai (和藤内) is the son of a great Chinese scholar who had worked at the Imperial court. However, after he scolded "the foolish emperor" he was forced to flee and landed in Japan. It was there that Watōnai was born. His father gave him that name because 'Wa' (和) which means Japan and was his mother's birthplace and 'tō' (唐) means China, where his father was born. At the beginning of Act 2, Scene 1 of the Battles of Coxinga by Chikamatsu it says that Watōnai was 20 years old and had married Kumutsu ('Little friend') and the narrator describes the scene in this diptych by Ashiyuki. Twenty and more springs have elapsed since the boy was born, and autumn is now passing, but November is warm as a second July. Husband and wife go out together in the evening calm, fishing baskets hung from their rakes, to dig clams for their livelihood. They look out over the beach and see the seagulls imprinting their seals in the sand, and the bay plovers clustering on the offshore islets. Watonai rakes the beach dried by the receding tide, and Komutsu, treading on clams, gathers shells of every kind, indifferent to the water that soaks her skirts. What are the shells that they gather? Hermit crabs, periwinkles, carpet clams . . . When the bamboo blind-shell is raised by the salt-blowing-shell, I catch a glimpse of a princess-shell and fall in love at first sight. I would like to take my brush and send a letter on a flat-shell. When her red lips-shells part and she smiles-shell, my heart-goes-to-her-shell — ah, what pain-shell! "You draw me to you and I would cling-shell to you, but my love is one-sided as the abalone- shell. Oh, cruel one! I could give you a taste of my fist-shell in your monkey-face-shell. Plum blossom-shells, cherry blossom-shells . . ." "Sleeplessly I all alone spend-the-night shell. For whom do I wait-shell? I forget-shell that people-may-see-shell, and only dream of how, when lying together in bed-shell, the joys of marriage will sink-shell into our hearts, and we will celebrate-shell with a triumphant peal-shell the happy beginning of our wedded bliss-shell." These were the shells that they gather. Among the shells is one, a huge clam, with its mouth open to the sun. Unaware that someone stands nearby, ready to capture him, the clam is blowing foamy brine. WATŌNAI : Yes, they say that clams sometimes spew out vapor to form castles. This is quoted from: Four Major Plays of Chikamatsu, translated by Donald Keene, pp. 75-76.